Martial arts training for kids is extremely beneficial! You want the best for your kids: Quality instruction, a positive and supportive environment, and a class structure that allows them to thrive. All of our instructors have been certified through rigorous testing for their ranks. Your kids will never be bullied, humiliated, or ignored in class. Our classes are designed to keep keeps engaged, having fun, and working out. Similar to submission wrestling, this bully-proof program is excellent for self defense. Classes are hands on, active, and high energy. 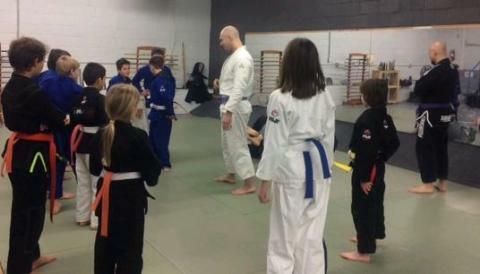 We have separate classes for younger kids (4-7) and older kids (8-12.) The class structures are a little different for these age groups. Kids ages 4-7 work on basic movements, techniques, escapes, and pins. Many of the techniques are hidden within games and fun activities. This keeps kids interested, smiling, and challenging themselves. We also work mental discipline within the class with specific activities and games. Kids are learning, active, and working on their focus. Older kids work on more involved and complicated techniques, including submissions, escapes, take-downs, and pins. Your kids will be active and sweating the entire time. They are working with other kids for most of the class, developing friendships and meeting new kids. These skills are not only awesome for self defense, they also build confidence, grit, self discipline, high self esteem, and perseverance.